Immunogen: Synthetic peptide corresponding to the N-terminus of rat CaMKII δ. Application Notes: Detects a band of ~50-60kDa by Western blot. Scientific Background: CaMKII (calmodulin-dependent kinase II) is an enzyme which is activated by increases in intracellular Ca2+ ion concentration and it has been proposed to be pivotal in regulating synaptic strength and maturation of synapses during development. This process is thought to be critical in memory and learning and in establishing the specificity of synaptic connections. There are over two dozen alternative splice variants of CaMKII which are encoded by four genes, a, b, g, and d with apparent molecular masses of 50-60 kDa. CaMKII is widely distributed in many tissues, but is highly expressed in brain. Several studies demonstrate that CaMKII is a multifunctional enzyme which modulates the synaptic strength by binding to a subunit of NMDA receptors and promoting the phosphorylation of this NMDA receptor subunit. CaMKII also regulates DLG localization at synapses by co-localization with DLG in the same protein complex. Experimental data suggest that CaMKII is critically involved in the development of morphine tolerance as well as dependence and inhibition of this enzyme may have some therapeutic benefit in the treatment of opiate tolerance and dependence. It also has been demonstrated that d CaMKII isozyme is down-regulated in human tumor cells indicating a role for d CaMKII isozymes in cellular differentiation. Changes in d CaMKII isozyme expression pattern in human hearts during heart failure suggest that CaMKII is important for regulation of heart function. This immunoaffinity purified antibody detects proteins of 50-60 kDa, corresponding to apparent molecular mass of CaMKII isoforms on SDS-PAGE immunoblots, in samples from human, mouse, rat, bovine, hamster, guinea pig, chicken and rabbit origins. Recombinant rat calmodulin-dependent protein kinase II a subunits expressed in sf9 insect cells are also detected. As the sequences of the rat a, d, and g isoforms are conserved over this amino terminus region, this antibody is expected to recognize the d, g and a isoforms. 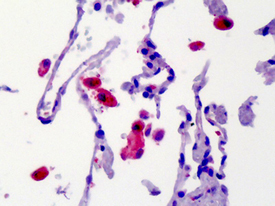 This antibody is not expected to cross-react with the b isoform. 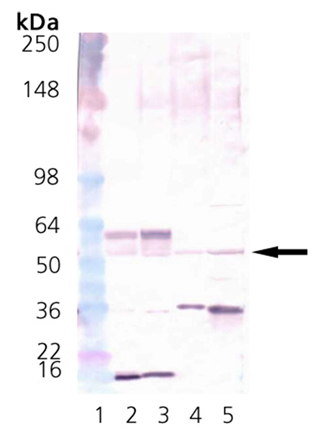 Proteins of unknown identity, ~40, 45 and 90 kDa, may be detected on immunoblot analysis with some lysates.